St. Augustine is the 1st official Compassionate City in Florida and the 20th in the world. During his report of an official trip to our Sister City Aviles, Spain, Dana Ste. Claire, director of the St. Augustine"s 450th Commemoration in 2015, reports that Mayor Joe Boles invited Aviles Mayor Pilar Varela Diaz to become a Compassionate City. 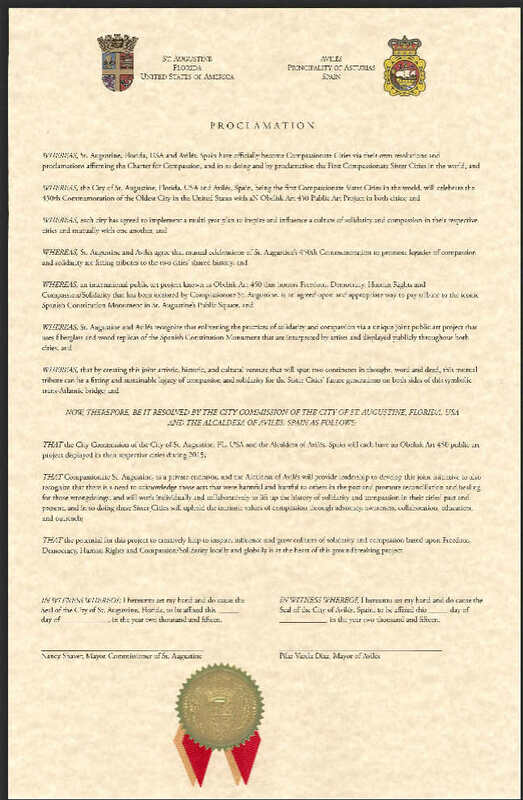 Mayor Diaz embraced the idea and has made the Compassionate Cities initiative and signing the Charter for Compassion a priority project of the City of Aviles. We have received a wonderful endorsement of this initiative and offer of support to help move it forward from the Charter for Compassion International. As a result we are now well on our way to becoming the 1st Compassionate Sister Cities worldwide.